Political views, an artistic way of history comprehension and analysis of personal and collective memory traumas are traditionally combined in the works of Serbian artist Milica Tomić. 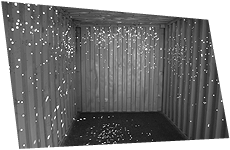 “Container”, the series of performances and video documentaries upon which the artist has been working on for ten years is centered in the analysis of war tragedy and intentional concealment of information about cruel bloodsheds. “Container” was influenced by the story of massacre of Taliban soldiers by American troops. In 2001 in Northern Afghanistan American troops put several hundred surrendered Taliban soldiers in container trucks. They were kept in heat without water and air. Those who survived this torture were shot point-blank with AK-47s. Information about this operation was kept in secret for a long time and there were no visual proofs of this massacre left. Milica Tomić uses fiction to recreate the forever and intentionally lost picture of war tragedy and immerse the spectator in the ingenious feeling of that remote war that kept being nothing more but a news line for an average person. During the years “Container” was presented in different continents and provoked different feelings throughout the staging process but every time the artist stays extremely precise towards the details of the tragedy in Northern Afghanistan. The past traumas’ reflection and intention to erase the shameful pages of the history in the work of Milica Tomić are intertwined with the memory of victims of ruthless civil war in the former Yugoslavia. Thus the “Container” becomes a global statement of the nature of shame, supplanting of the guilt and the burden of history that we can’t choose but inherit from our motherland. The central part in the work of Lebanese artist Walid Ra'ad is given to introduction of eyewitnesses of important events’ into media sphere and analysis of historical facts. "The Atlas Group" is his long-term project where he is in charge of collecting the testimonies and facts, mostly of modern Lebanese history, not covered by historians and journalists. "The Atlas Group" and its few contributors reconstruct the forgotten or misinterpreted history by searching for cross opinions and the testimonies of lost witnesses. The found heroes of the ancient events give new opinion about well-established notions of the past. 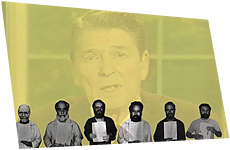 "Hostage: The Bachar Tapes" is a videotaped reminiscence of one of the hostages during the military conflict between Iran and the USA in 80’s and 90’s. Six years after liberation the Lebanese Souheil Bachar tells for camera about his ten-year experience of being hostage with Iranian soldiers together with five Americans. In 53 videotapes he recollects the life of hostages in the fear of death and violence, their methods of communication and treatment of sexual tension while still feeling themselves the participants of military action despite being held in the atmosphere of inaction. In his work Walid Raad asks if the history is created through weighed analysis of facts or through personal and subjective statements such as "The Bachar Tapes" and whether it is possible for one interview taped years after the event to put a new emphasis on a well-established story. History is a pile of facts from which everyone gets his own truth and it is also the most virtuosic and dangerous modern fiction. In the end, can the history be considered well-established while still being rewritten in front of us when the new facts and opinions are found? In 2007, three artists joined the conservative Slovenian Democratic Party (SDS). The welcome letter they got from the party’s leader and Prime Minister of Slovenia, Janez Janša, ended with the slogan "The more of us there are, the faster we will reach our goal!" Immediately thereafter, each one of the three artists officially changed his name to Janez Janša. With this gesture they question the relation between name and identity in wider social, political and cultural context. The work "Troika" deals with 3 pillars of contemporary biopolitics: politics, law and economy. The artists display a set of official documents indicating their political orientation, legal state and economical way of operating: 3 SDS membership cards, 3 ID cards and 3 Mastercards with the reproduction of their earlier action "Mount Triglav" on Mount Triglav (the highest mountain in Slovenia and preeminent symbol of the Slovene nation, a stylized depiction of which is the central element of the Slovenian coat of arms, and is in turn featured on the flag of Slovenia). These documents are displayed in opposition to a video showing the letter the 3 artists wrote to the politician Janez Janša soon after changing their names. Realized in collaboration with Aksioma — Institute for Contemporary Art, Ljubljana with the support of the Ministry of Culture of the Republic of Slovenia and the Municipality of Ljubljana. The nature of photography or video as a visual pro or contra testimony in the face of history or law is emphasized in the works of Australian duo — brother and sister Jack and Leigh Ruby. In the 70’s and 80’s the artists were actively criticized and dissected the system of social compact and modern capitalism by staging crimes and incidents involving themselves or their property and obtaining deserved compensation after going through all legal procedures. Later their practice of forgery and staging resulted in Ruby’s family being put in Australian prison. Their staged theft of their car on the car wash was put on accusation file in court and after that the artists were sent to prison for ten years for fraud and perjury. The picture from the Car Wash Incident installation is the only material evidence which determined the case against them. Years after being released from prison and looking back at their rebellious past and all undermining activities the Ruby duo has come back the to public with the question of relation between reality and staging, paradoxical the specifics of pictures and video as instruments of accusation or discharge. The installation allegedly restores the events of that day when brother and sister Ruby decided to commit another crime in the name of art and staged a domestic performance involving the car robbery. All the heroes of the photo talk about that day and the crime from their point of view, all of this is staged in front of the imaginary court which, this time, is not going to end up meaning time in prison for the artists. German video artist Harun Farocki’s fifty-year experience in documentary is perfectly demonstrated by his exploration methods in the four-part “Serious games” video installation dedicated to the technologies of modern war. Simulations, synthetic cities and computer games as a principal education program of modern tactical action are examined by Farocki in three videos with computer screen, keyboard and computer-designed mountains and deserts becoming the battlefield for recruits. 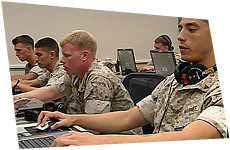 The main heroes of the documental part of “Serious games” are American soldiers and their teachers who agreed to consider digital simulations a real military camp where one can learn partisan warfare, averting of the terrorism acts and enemy’s annihilation through military operations. The soldiers’ faith in programmatically generated illusion is the key to successful war actions and survival. The faith in fake reality in “Serious games” is the guarantee of life preservation. The fourth part of the installation unlike the previous documentary ones, is a staged video involving actors performing as war veterans seeing psychologists in order to treat their post-traumatic war syndrome. This practice of using the same methods for learning to be at war and to forget about it is quite common in the American army. Posttraumatic disorder is treated with the help of same simulations, when the psychologist uses computer program to recreate the landscape impossible for American reality and immerses the war victim with mental disorders in it in order to resist painful memories. In Farocki’s opinion, the instrument of war can also be the instrument of recovery and this dualism is only possible in the game reality. With this project these Swiss artists, creators of Internet simulators and online galleries, decided to address the idea of programmed idyll. In the “Mountain Top” installation Monica Studer and Christoph van den Berg are playing with their origin and create an imaginary landscape. Alpine meadows and mountains are among the most popular stereotypes, the object of consumer fantasies about peaceful vacation during hard times. Empty landscapes with static life hidden there is an absolute cliché of a place on Earth where a man exhausted with the modern competition, victories and defeats can stay alone with his thoughts in a sterile and serene environment resembling another world. 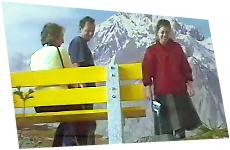 In 2005, the British Gateshead Museum visitors could enter an artificially constructed landscape with a bench in it and enjoy an imaginary view of the Alpine mountain top. During that moment they were videotaped and the pictures were put online. Working with the fetishes of consumer society the artists imitate advertising and tourism industry which imposes the feeling of unique experience by creating a pastoral fiction that you want to find yourself in. The “Mountain Top” is a graphic example of the fact that client always wants happiness in a cozy and festive package and what he gets is a synthetic pattern with ideal vacation attributes. The bench in the middle of the showroom surrounded by alpine views is a metaphorical teleportation to sweet illusion and a unique tourism experience. Like those from Britain, the Moscow exhibition photos of visitors sitting on the bench are sent to constantly updated online gallery. This way the database of virtual tourists who chose their imaginary ticket to paradise on Earth is created. Virtual simulations replace real life, give new meaning to habitual environment and revive soulless information but can they criticize history or create convincing copies of historical events? The phenomenon of synthetic online spaces is addressed in the joint project of American media artists Nonny de la Peña and Peggy Weil in the frame of “Immersion journalism”. In their interactive installation Gone Gitmo they generate protected and inaccessible space of the infamous American prison Guantanamo Bay. You can become imprisoned in one of the top secret objects straight by the Unity 3D game engine in the regime of online submerging. The project is based on the documentary research "Non-Constitutional" by Nonny de la Peña about Guantanamo imprisonment and absence of habeas rights there. Generating illusions in computer games and personal borderline condition in virtual reality has been introspected in contemporary art for years but the artists add social and psychological connotations to this experience. The phenomenon of the spectator's feelings as a computer tourist in the place of suffering and mass imprisonment and the immensity of his immersion into history though online game experience instead of habitual media forms like TV and the news can be experienced by every visitor of the exhibition with the help of a game joystick leading to Guantanamo. Artists simulate the reality of this inaccessible and unique experience of restrictions basing on the former prisoners’ testimonies. The fiction designed and programmed this way is more realistic than general notions of the place that few are likely to visit. This place offers the experience of imprisonment that will never happen to a person who is free as a part of a parallel reality. In the times when explicit photo reportages and news lines distance us more and more from the horrors of war, and even the formula "horrors of war" has lost its power and turned into a banal constatation, Israeli artist Omer Fast reflects on the very essence of military casualties in his video installation "Continuity". We see inspired parents going to the station in a car to pick up their only son, who has just returned from war. The traditional reunion of the family over the supper does not reduce the pain of separation and the experienced stress only creates a greater distance between the parents, who have lived safely all this time and the son whose trauma makes adaptation impossible. The continuity of the past pain, the impossibility to refuse the past and the value of suffering come to the foreground: the long-awaited idyll turns into a nightmare in just a few hours. All the expectations of the salutary meeting are transformed into a painful role play where desires are repressed. The scenario once failed repeats itself again: the parents are again on their way, and at the station a similar young man in uniform waits for them. In fact both these young men have nothing to do with these parents. All young men in uniform are just hired actors, who take part in the reconstruction of the return which never happened, trying to help the parents to fill the huge emptiness. None of the scenarios of the return has a happy end. The director just smoothly moves the accent from the son to the parents and back, showing the total fatality of all the participants of this tragedy. Avoiding a straight interpretation of military syndrome, Omer Fast reverses the notion of "war victim". Taking into account all the victims of war it is not enough to talk about the dead and count the veterans, who returned back home, — their families are traumatised not to a lesser extant. They lost contact with the reality and the relations with their close ones. A fine psychological play between all the participants and hardly perceptible details of relations in the family and the society are brilliantly caught by Omer Fast. They made Continuity one of the most touching and powerful projects of the Cassel’s dOCUMENTA(13). One of the constant motives of the work of an Indian painter and video artist Ranbir Kaleka is the superposition of mythology upon the reflexion of the events of the present. The protagonist of the “House of Opaque Water” is an elderly Indian man lost between the past and the present. His name is Sheikh Lal Mohan. The village where he grew and lived is gradually sinking under water in his sight. Surrounded by muddy water he observes Surdanbans among the mangroves, where his ancestors lived for the centuries, swallowed by the world ocean as a consequence of the global warming and climate change. Together with his character Ranbir Kaleka embarks on a long journey: they travel 800 years back in time into a semi-mythical magnificent city of Muziris, which also, as well as the village of the protagonist, went under water. Documentary shooting and real history become a starting point in the artistic narrative about the vulnerability of human life and culter in the face of even minimal fluctuations of natural balance. The basis for this work were the studies of eco-activists and the real story of a man losing his natural habitat. He covered his ideas in a meditative sensual narrative about the nature of relations between people and an element. Poetic interpretation of the past and inimitable silent beauty of South-Asian landscapes bring the narrative to inevitable defeat of man from the constant and relentless power of the natural world. The protagonist will inevitably meet his end in the house of opaque water. Moscow artist Yelena Gorbacheva studies the life of the newcoming migrants that flock to the capital for work, bringing their own national traditions, customs and festivities. Although all that helps the newcomers to keep links to their roots, to the Motherland of their ancestors, Muscovites find it difficult at times to accept it. The artists depicts the essence of the conflict that took place for real and more than once in Moscow and has become a subject of debate in mass-media. The author was amazed at the level of aggression and hostility on both sides. Reading the newspapers and listening to the reports on radio and TV she asked herself whether there was any solution to this conflict, where the metropolis life-style of the Muscovites is opposed to the national tradition of migrants. In her work the artist decides to push the conflict to the extreme and acquaints the nationalists, who hate the migrants a priori, with the migrants from the North Caucasian republics. This is why — thinking about her work — the artists turns to the genre of mocumentary which allows her to take her audience away from the conventional stereotype thinking and to dust off the drowsiness of predictability from the plot and the conflict’s resolution. She has her own way of modeling the moment of climax, the unexpected turn of events and the finale. The author studies the allegedly impossible combination when the conflict is not to end in blood and victims, encouraging her audience to believe in the reality of such a scenario. This is why it is not the main characters who are in the focus of this work, but the reaction of the people who became the involuntary witnesses of the events. One of the mist important accents that the author has made is the reactions of children, not dimed by ideology and politics, but based on curiosity and openness to all things new. Speaking of tolerance we can not always imagine what it looks like. The author does not hurry with the final conclusions. Her task is to let the audience experience this story and leave with the questions: what I should think about it? Should we accept or forbid? Should we admire or judge? 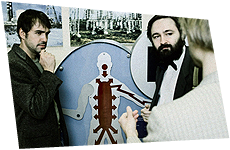 Andrei Sharov and "Thanatos Banionis"
The eighties. For the space once occupied by people with a proud name “sovetskiy” this decade became the whole era. Experience which civilizations normally gain through generations has been unleashed on the idealistic minds of people.They were a part of a grand experiment of creation a revolutionary new community, which should have been implemented the concept of social equality and political stability. We shouldn’t blame people who piously believed in the ideals, who were exposed to the most severe test of loyalty to themself and their ideas through all these years. The depth of the split in the Soviet society has exposed its scope due to changes in the country. One of the poles that attracted independent and looking for a new life people was brought from outside punk subculture. The project, created in the genre mocumentary on the basis of documentary materials, evidences of participants of the movement that united young people from very different groups. It tells about punk band SDS ("Sindrom Dlitelnogo Sdavlivaniya" which is "Crush syndrome"). This group was created by people grown in the political and social establishment of the USSR, and this does not fit the conventional concept of punk culture. But at the same time, this detail emphasizes that their protest was not related with material discomfort in contrast to their western associates. The chronology of SDS is inscribed in this turbulent historical period in Russian history, it has become a reflection of the tragic fate of people, ideas and hopes of the time, which ended just as tragically and suddenly as it ended the life of members of the group. The dramatic logic of that time allowed to be honest only to those who remained in that time and never got old enough to look at the past from the height of the tower of Babel at the Present.